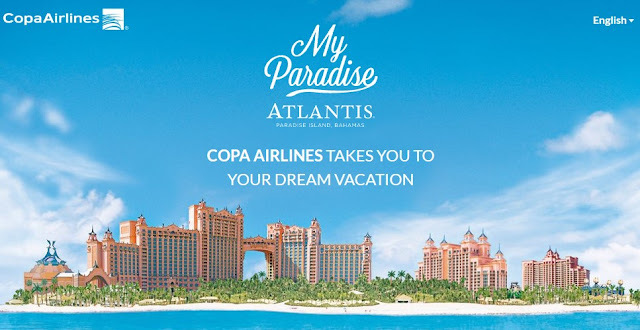 Copa Airlines is giving you a chance to enter once to win a fantastic $10,000 dream vacation to your very own tropical paradise in Atlantis, Paradise Island in the Bahamas! The prize consists of: Four (4) round trip plane tickets to Nassau, Bahamas. Accommodations for four (4) days and three (3) nights for four (4) people in a double room at Atlantis Hotel Royal Towers (taxes and service included). Transportation from the airport to the hotel and from the hotel to the airport for four (4) people. The Atlantis meal plan (breakfast, dinner and non-alcoholic drinks) for four (4) people during their stay at the hotel. Shallow-water dolphin interaction for four (4) people ONE TIME during the stay of the winner and his or her travel companions. The value of this prize is nine thousand nine hundred and seventy-five dollars and 00/100 (US$9,975.00).